In many instances, it is easier to do the Feulgen reaction for DNA with tissue fragments [e.g., a lobe of the larval fat body (25,30,31) or a whole-organ sample such as a pair of larval salivary glands (25)] and then disperse individual cells and nuclei after their staining en bloc for the DNA (see Note 7). Individual Malpighian tubules (25,33) and ovarioles (20,21,62,63) (see Chapter 6) or testes (2,25), for example, are very well suited for DNA staining prior to their squashing to obtain banded polytene chromosomes (17,20), single egg chambers (21) (see Chapter 6) or individual sperm (2). The staining procedure is much the same as that listed above, but the duration of the steps has to be adjusted to provide enough time for diffusion of materials in and out of the tissue and the exchange of the Schiff's reagent through the barriers imposed by multicellular tissue layers. To avoid nonspecific staining, it is particularly useful to double the number of the bisulfite rinses after completion of the Feulgen staining step. Rinse small tissue pieces in at least three 5-min changes of bisulfite water before rinsing the tissues in deionized water before moving to a final water rinse of 2-4 h in the refrigerator to remove any excess SO2. If there is residual sulfite in the tissue, it will effectively bleach the magenta Feulgen-DNA complex and the preparation will fade with time. 1. 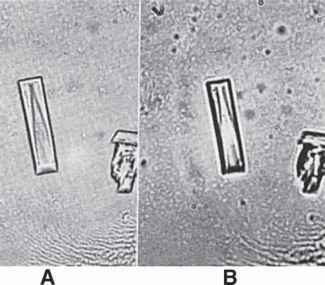 Place very small pieces of en bloc-stained tissue on a clean "subbed" glass slide to swell in roughly 400 ||L of 45% acetic acid for 1-2 min. 2. Carefully drain the 45% acetic acid with a small plastic pipet or with a small piece of absorbent paper, taking care not to let the pipet tip or paper touch the tissue. 3. Quickly add a small droplet (200 |L) of fresh 45% acid. 4. Add a 22 x 22-mm2 cover glass and squash the tissue onto the slide using the tips of a fine forceps applied with a repeated tapping motion to crack the cells and allow nuclei to disperse and then be held flat by the forces of capillary action under the cover slip. 5. Complete the squashing process using moderate finger pressure applied only downward to avoid shearing the flattened tissue. 6. Freeze the squashes in liquid nitrogen or between two cakes of dry ice. This allows easy removal of the cover slip from the frozen slide by using the sharp edge of a single-edged razor blade to flip the cover glass upward and off the frozen slide. 7. Thaw the still-frozen slide in two changes of absolute ethanol and allow to air-dry for storage in the dark until mounted in refractive index liquids for measuring.